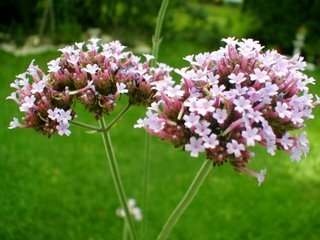 Also known as Purpletop Verbena or Purple Vervain, this has proven to be one of my favorites this summer. Somehow, the blossoms seem to have lasted all summer. 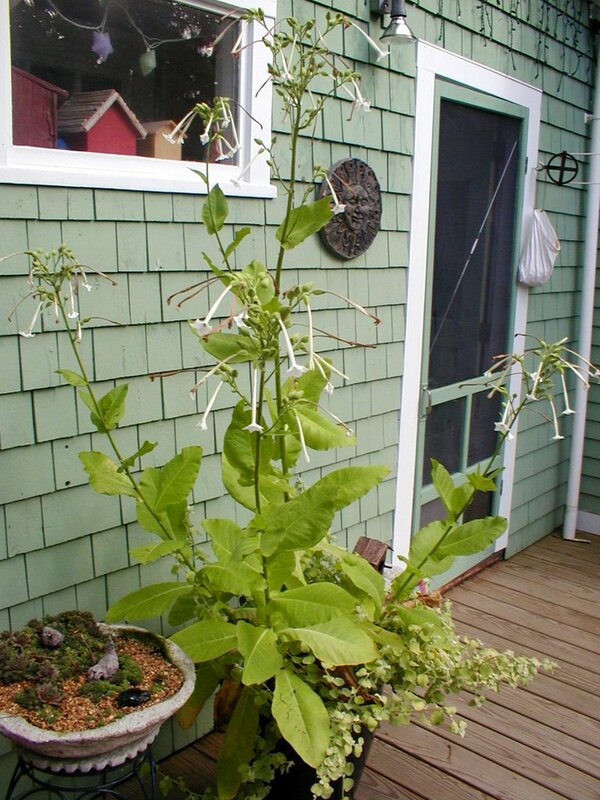 It has grown quite tall and has a lovely airy look. A favorite with butterflies, it has also been a hummingbird magnet. Even though it is in a deck planter right next to the dining table, the hummingbirds come darting in for a sip of the nectar, ignoring us humans. One morning, a female hummingbird came, and as she pulled away from the flower, one of the little florets stuck to her beak, it was adorable. 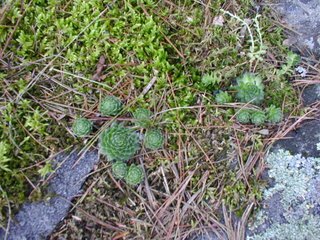 The online database FLORIDATA has some good information about this plant, which unfortunately appears to be an aggressive self-seeder in some warmer climates. 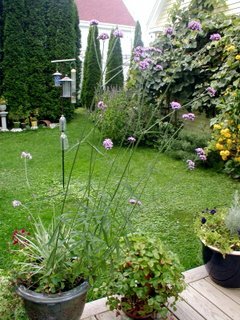 I hope that won't be the case here, because I've loved it this summer, and plan to grow it again next year. with the need for constant deadheading of its sticky flowers, and bug-ridden. Based on its performance this year, I'll think twice about trying this one again. We've neen jamming in the Henbogle kitchen. It has been an exceptional year for fruits -- at 25 lbs., we stopped counting how many blackberries our patch had produced, and other fruits are gorgeous as well. 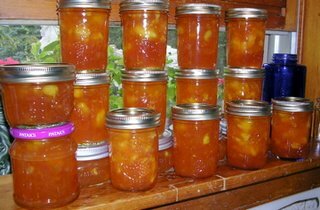 With all this gorgeous fruit, I made jam, lots and lots of jam -- blackberry, peach, ginger-peach and blackberry-peach jam, to be precise. 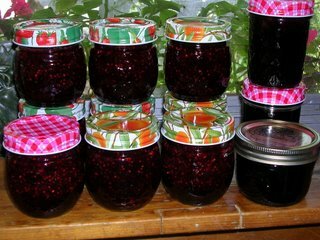 All in all, I've got about 30 half-pint jars of jam stashed away in the pantry -- the majority of which will be used as gifts, but I'm sure a few jars will be gracing my toast, too. 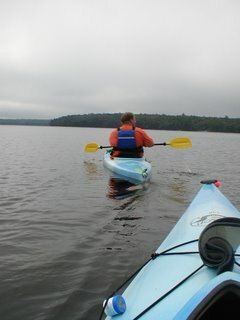 Saturday morning, we got up early to meet friends Lynn and Mark for a morning paddle on Nequasset Lake. Lynn suggested earlier we pack a breakfast, and I immediately agreed recalling fondly my floating lunch days as a counselor at Camp Pondicherry Girl Scout camp. It was cool and overcast, but beautiful. The mist was just lifting when we put in at about 7:30, and the lake was glassy calm. We paddled about halfway up the lake and found some ledge to stop at for our picnic breakfast. I'd had a technical challenge that morning, so my blackberry-ginger scones became blackberry muffins (scuffins?) as we were out of butter (out of butter? how can that be?!) -- not terrible, but not scones, either. Adequate, sort of -- not an accolade I like to apply in association with my cooking. Fortunately, the cheddar-broccoli quiche made from our own broccoli and eggs was yummy, and Mark brought a batch of fabulous blueberry muffins, and the view from our rock was gorgeous. With hot coffee from the thermos, breakfast bordered on divine. As we ate and chatted, the mist began to clear. 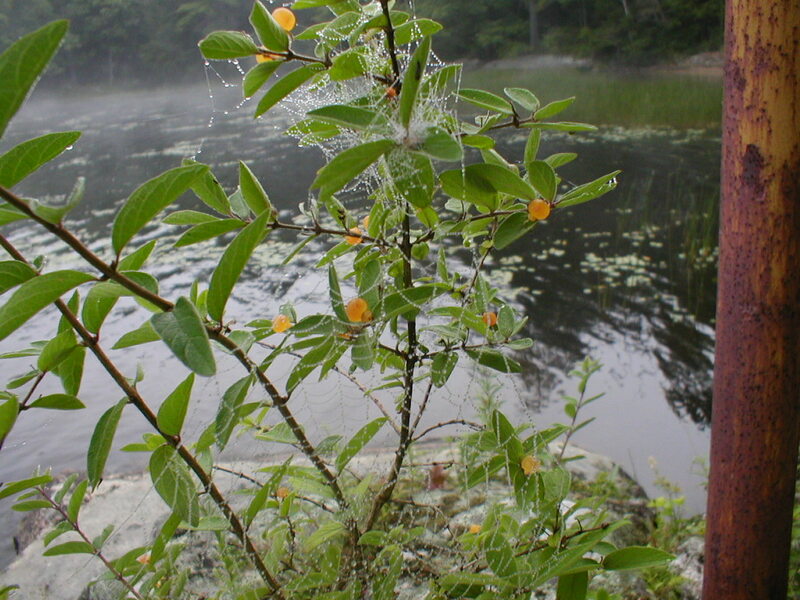 In frot of me, the dew on a spider web became more visible against the backdrop of the lake. 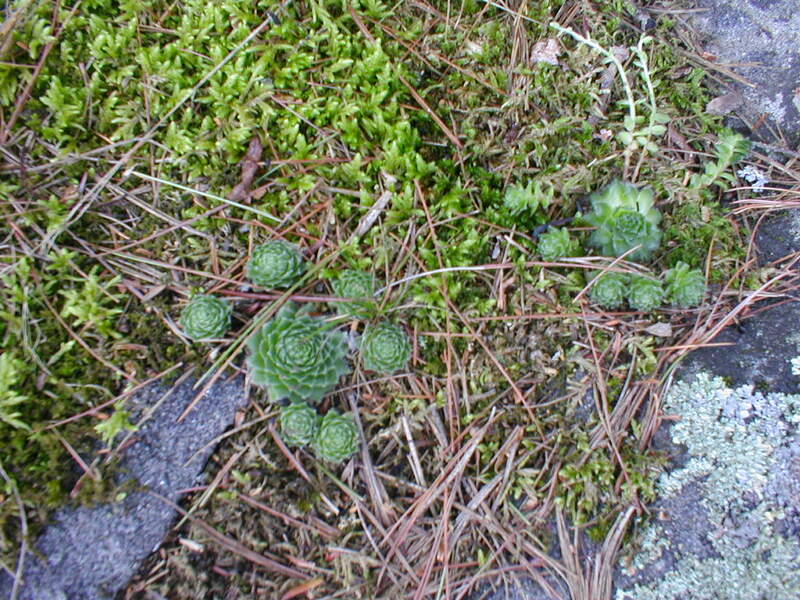 Preparing to leave, we noticed some hens and chicks growing on the ledge, escaped from someone's garden, no doubt. As we paddled the rest of the way around the lake, the cloud cover lifted and the sun came out, and by the time we returned to the boat landing, it was warming up nicely. 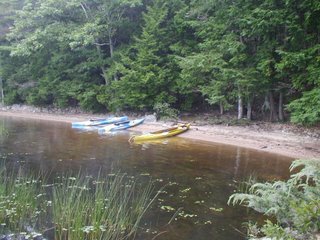 Which turned out to be a good thing, because as I disembarked from my kayak, things went awry, and in the blink of an eye, I was swimming --oops! Some additional practicing on the getting in and out of the kayaks is called for, I'd say. The kayak, however, stayed upright, and our gear remained dry. Phew! Soaked to the skin, wearing cotton, I quickly got cold. I know cotton and canoeing/kayaking is a bad mix, but haven't had a chance to upgrade my wardrobe to include kayaking friendly synthetics. Still, once I shed my soaked t-shirt and donned my dry fleece jacket, things improved. We loaded the kayaks and headed home for lunch. At lunch, sitting on the deck in the sun, we got the laptop to check the weather. The forecast called for cold, overcast and showers likely for Sunday. Not good kayaking weather, especially sans synthetics. In a wink, Dan and I were loading the boats again, and we headed back to the lake to explore the other boat launch. Jam and pesto could wait. At the lake inlet, we paddled upstream a bit until a large snag blocked the way, then we turned around. The water was calm and glassy, but as we got closer to the lake, the wind picked up. I'd hoped to practice my entrances and exits, but it wasn't the day for that, so we paddled a bit to get accustomed to the way the boats handled in the wind and waves. In all, we spent a glorious 5 1/2 hours on the water yesterday. I hope we have a long, warm fall; it would be great to spend the next 6-7 Saturdays the same way. Pesto! We've also got some flat-leaf parsley, finally recovered from the groundhog, broccoli, radishes, and Rose and Sungold tomatoes. Yum. at a farmer's market, is profound. Today I took a new colleague, here from the Phillipines just for the semester, to the local farmer's market. We wandered around looking over all the offerings and enjoying the buzz of the busy market. 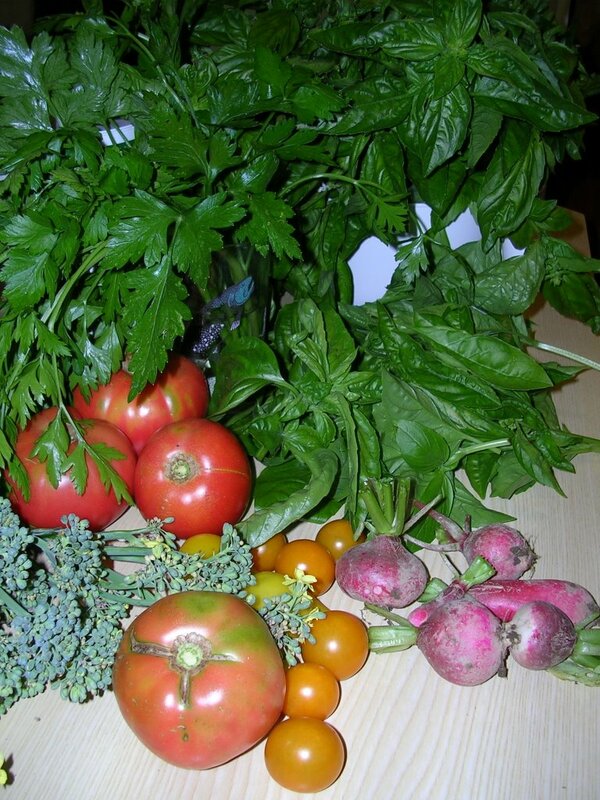 Joann found potatoes, garlic, basil, and more yummy treats for dinner, and I found locally grown treats as well. In addition to being a great source for yummy locally grown produce such as these beautiful peaches, it is also a great opportunity to talk with knowedgeable growers who seem happy to discuss the merits of various tomato varieties, or, Reliance peaches versus Red Haven. 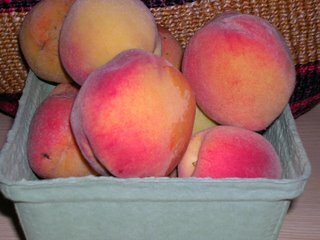 And then I get to taste them and see for myself, and call it research for selecting a peach tree(s) for next spring. Life is good. But these delights signal the end of summer , and my summer holiday ended this week, with my return to work. 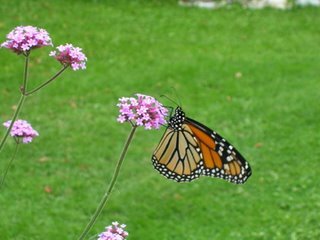 Yes, it good to see work colleagues, my favorite students, to meet new students eager to make their mark on campus, but oh, I miss the days in the garden, and the freedom to follow the rhythym of the sun. Still, the gorgeous weather allows us to fit in a later afternoon/early evening paddle. 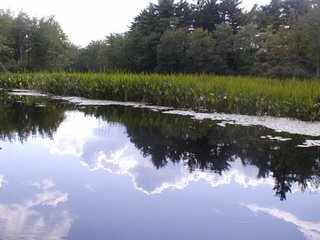 Yesterday we tried a new spot, Nequasset Lake in Woolwich. What a beautiful paddle! The lake serves as the source for drinking water for several nearby communities, so there is very little development as the water district owns much of the shorefront. It was a delightful paddle, one we will do many times again in the future, I am sure, as it is only a short drive from the house. We have no photos today, as we were in a rush to get in the water and forgot the camera. 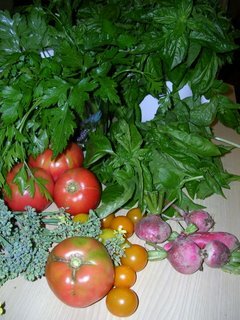 Perhaps there will be more paddling on Wednesday, and on Thursday, we plan to make pesto for the freezer, yum! I'll share the process then. Now, it is time for work! Owning a handyman's dream home is really a dream (I am actually serious) but it does tend to monopolize your life if you are not absolutely vigilant about making other plans. While I honestly do get immense satisfaction out of working on the house, there are some things I have missed, like paddling. 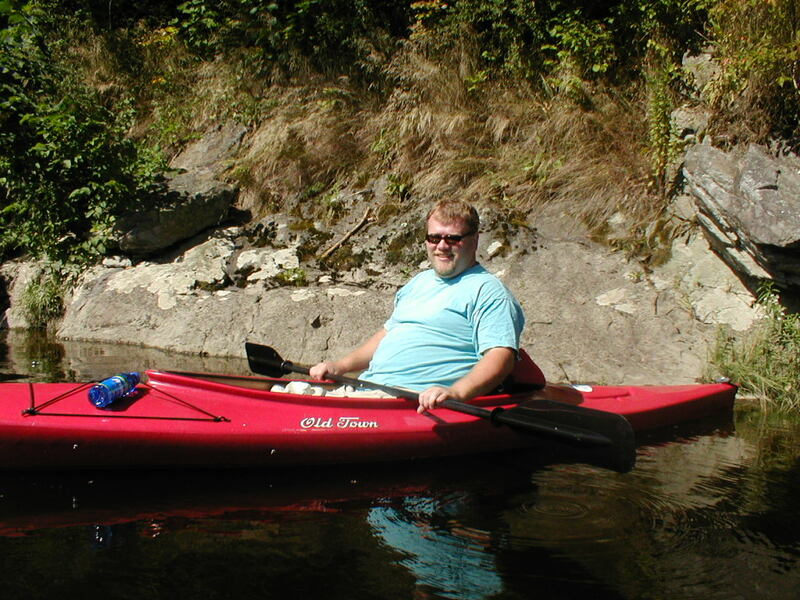 Dan has never done much paddling, or boating at all really, if you dismiss the brief flirtation with an aging ski boat he bought before he met me. 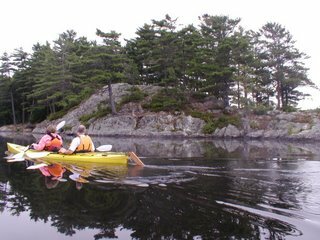 I worked summers through college at a Girl Scout Camp and then lived in on Moosehead Lake, so I had a lot of opportunities to paddle, including some coastal paddling trips. As we now live within 1/4 mile of the Kennebec River at Merrymeeting Bay, it seems like too good an opportunity to pass up. Thus we began seriously talking about the idea and what kind of kayaking we wanted to do, and what kind of boats would best suit us. We rented a couple of Old Town Canoe Loon 138 kayaks and spent about 2 hours paddling yesterday, and went for a long paddle on the Kennebec again this morning, and we are hooked. 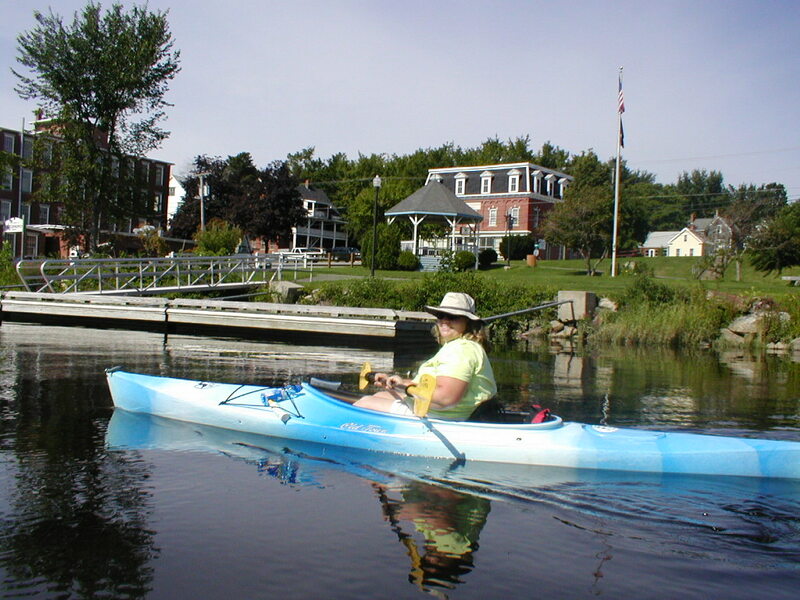 Our little town has a magnificent boat launch and waterfront park, and the view of town from the river is wonderful. Without even really focusing on birdwatching, we saw loons, osprey, bald eagles, several great blue herons, and a kingfisher. It was glorious paddling. 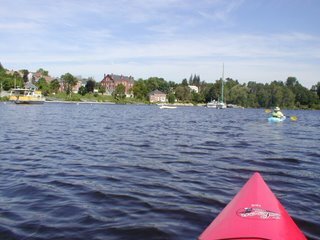 Those two kayaks are staying with us, our rental agent just also happens to be an Old Town dealer, and we got a good price on (barely) used kayaks. Although Dan is pictured here in a red one, we both got cloud blue kayaks. 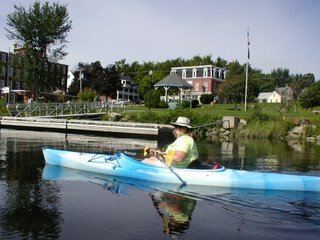 Look for us on the water again tomorrow --that is, if my arms can move! It has been a few years since I paddled on a regular basis. I love life in Maine. Our first tomato, and it was good! It is a Rose de Berne slicing tomato. Yes, it cracked, that is one of the hazards of our raised tomato bed. It still tasted grrreat. 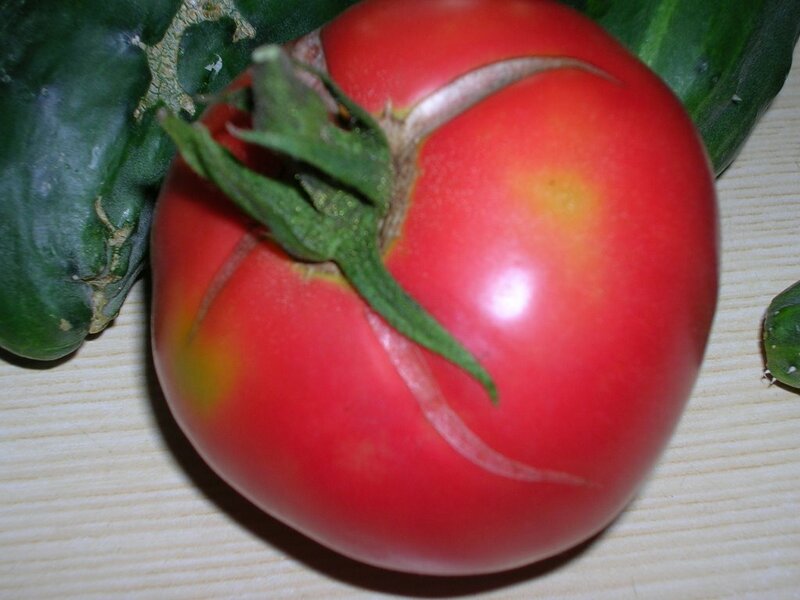 In a blind taste test, Dan awarded it first place over a lovely organically grown tomato from Goransons --and Dan doesn't really even like raw tomatoes (a texture thing). 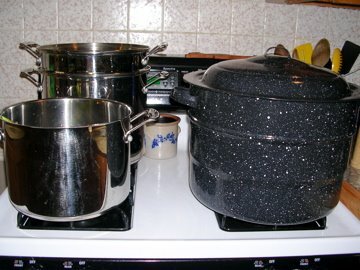 We ate it with some chicken and black bean tortilla soup, mmmm. We finally finished painting one side of the barn, it looks great. 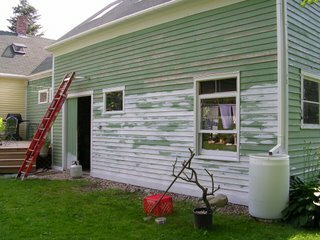 Let's hope it stays looking good at the very least until the remaining sides are painted, preferably far, far longer. 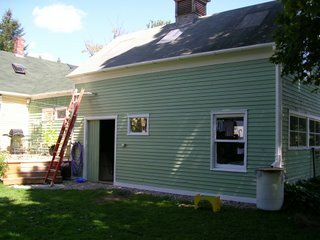 (Just a personal reminder/reinforcement: Vinyl siding on an old house looks cheesy and only wimps succumb to the lure of pvc). There were some grumpy people in our house Tuesday, after a long and unfortunately fragrant night. In addition to the skunking, Fishy, banished to the shed which connects house and barn, managed to open the door to the barn and again get into the garbage. His garbage-eating resulted in much off-gassing, leading to serious indoor air-quality issues once he was allowed inside Tuesday evening. When not living out his ancestral carrion-eating fantasies, he barked intermittently much of the night, making sleep a challenge on my part. Thus, Tuesday was a long and not very productive day, with Dan and I both stumbling about like zombies. Skunk aroma up close leaves me with a headache, which tagged along with me all day. This all could have been much worse -- the first time Fisher got skunked with us, (actually his 2nd time --once with his previous owners) it was during a late February thaw, and it was a direct hit. We could see the dark greasy stain on his chest where the skunk got him. Even though we were able to use the miracle hydrogen peroxide cleaner, it was such a close-up hit that the odor hung in the air, permeating the house and yard. It was too cold to leave him outside even in the barn, so we let him in the laundry room. Winter meant we couldn't open wide the doors and windows, and even though we did ship him off to be groomed the very next day, the smell lingered for quite a while. This time, I don't think Fisher took a direct hit, and a rain shower later in the night helped to dilute the smell from the yard. During the day, the warm temperatures allowed us to open all the doors and windows and let the breeze clear away some of the smell. Fishy, too, spent the day outside letting the sun and breeze deodorize him. Let's just hope it is the last time we ever experience this -- although yesterday I did purchase 2 more quarts of hydrogen peroxide. Just in case. 6:45 pm: Fisher gets into the garbage. 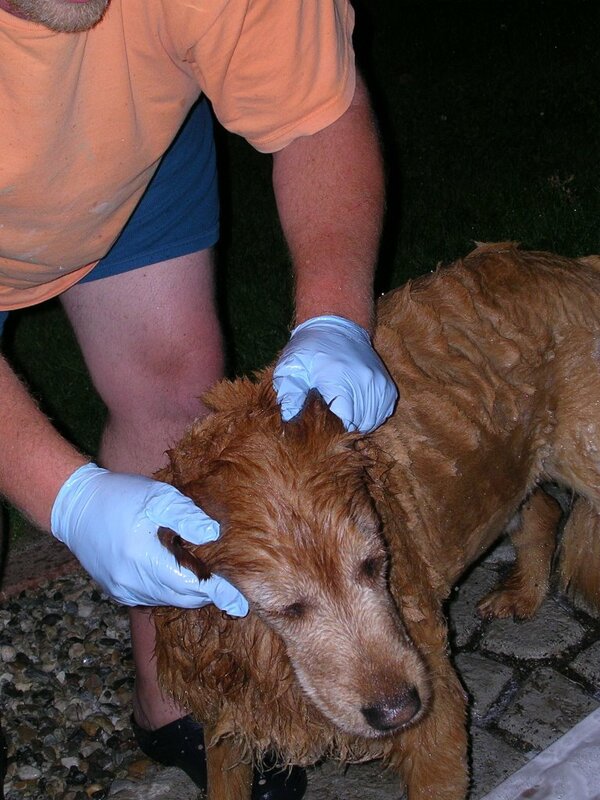 Fearing digestive repercussions, we decide to leave him outside until we retire. 10:25 pm: While viewing the first episode of Boston Legal on DVD (thanks Lynn! 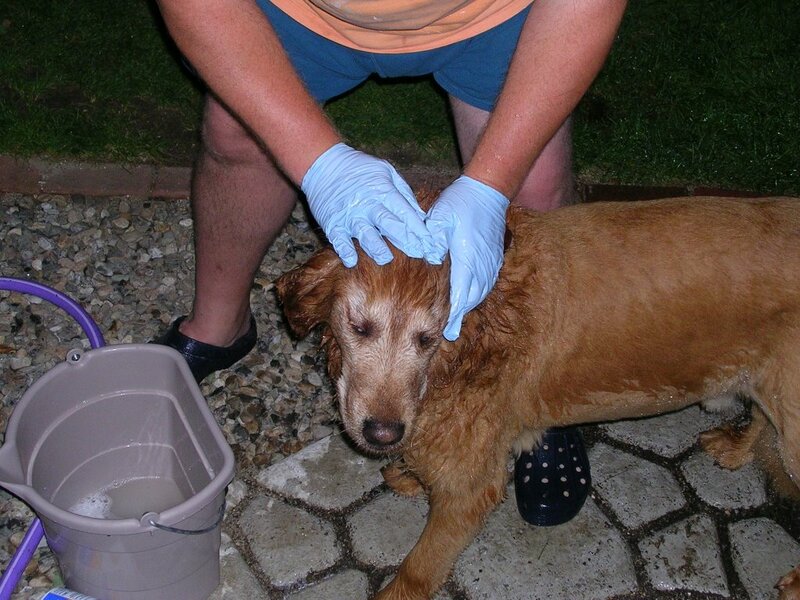 ), the dreaded aroma of skunk wafts into the house. We gasp in horror, and as one, we bolt for the door. Alas, it is true, Fisher and skunk go round 3 -- will he EVER learn? More than ever, I am convinced he really is dumber than a bucket of rocks. Fortunately, we have on hand the magic potion -- 1 quart of hydrogen peroxide, 1/4 cup of baking soda, a healthy squirt of dish detergent. Even so, he is sleeping in the barn tonight. After picking another 5 lbs. 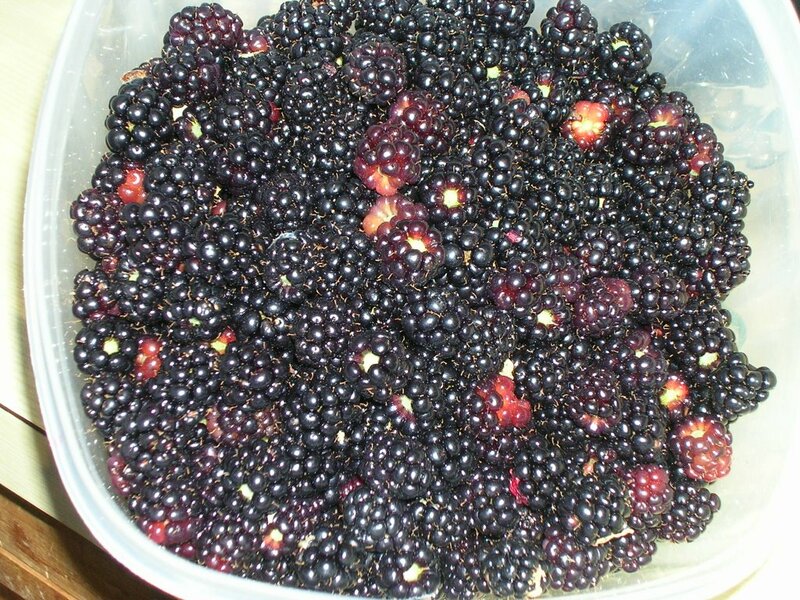 of blackberries yesterday (for a new total of 17 lbs.! ), I decided today was a good day to make some blackberry jam. 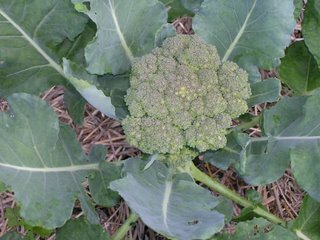 I made 2 batches, the second batch I strained to remove seeds, which resulted in a much lower yield. 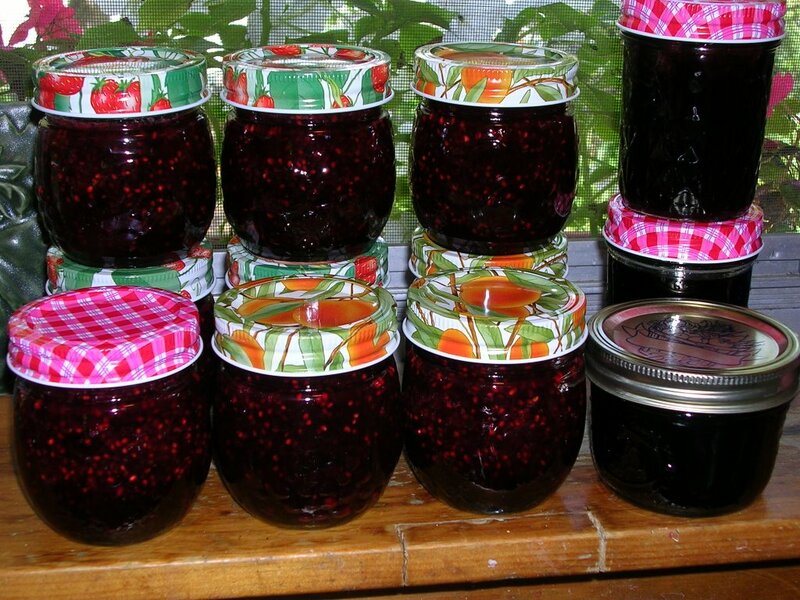 All told, we had 9 half-pint jars of regular jam, and 3 half-pint jars of strained jam. 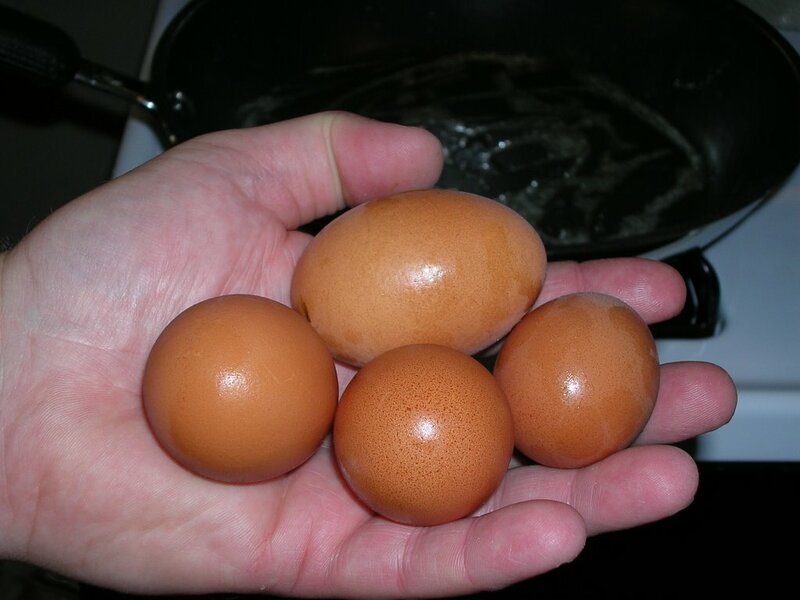 Henbogle's happy hens have been busy, as of today presenting us with 6 eggs. 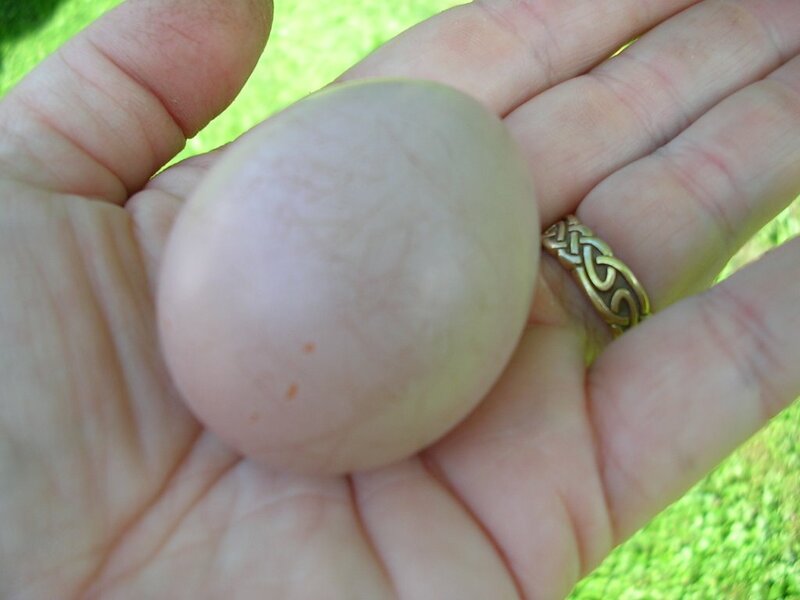 (Two were not properly formed, missing the hard outer shell, which according to my research, is common with young chickens just beginning to lay.) 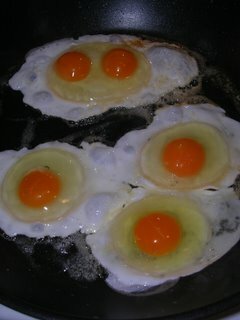 Four lovely, edible free-range eggs to the good, today was the day to crack them open and taste the goodness. We cracked open the largest egg, and were surprised to see a double yolked egg! That explains the larger size of this egg. The yolks were bright orangey yellow, and fried in butter, we were in egg heaven. There really is a huge difference with fresh free-range eggs from our own hens. This is a good thing as eggs were n ot my favorite food unless amended with good cheddar cheese -- I was more interested in the chicken augmented compost I foresee for the future. And yes, our hens are once again happily free-ranging. 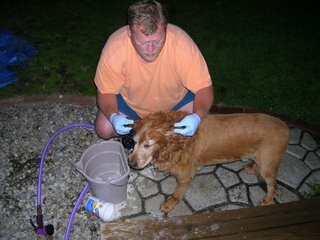 Dan and I completed fencing in a significant portion of the back yard and released the girls from the henitentiary. The girls are ecstatic, and happily scratching up the grass and weeds, eating bugs, and making themselves a magnificent chicken spa (aka dust bath). 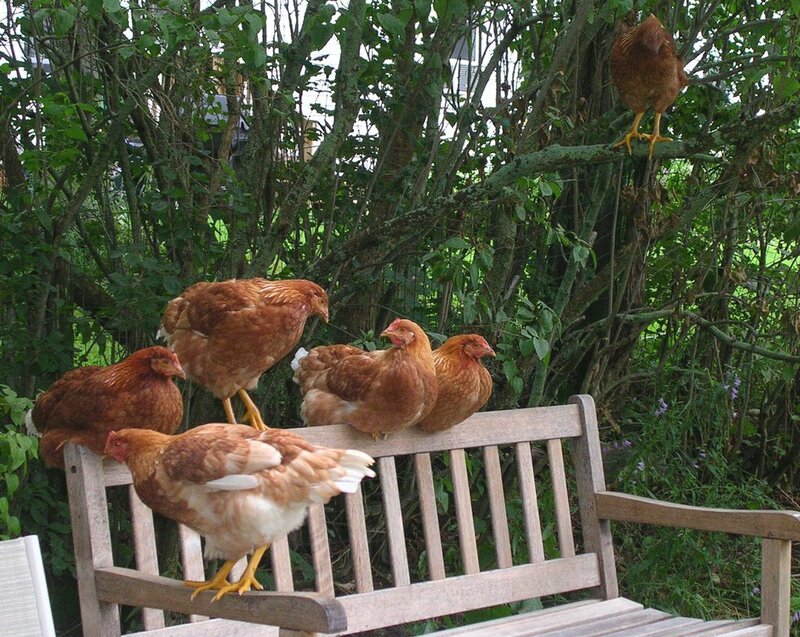 Happy chickens, delicious eggs, all is well with our little world. 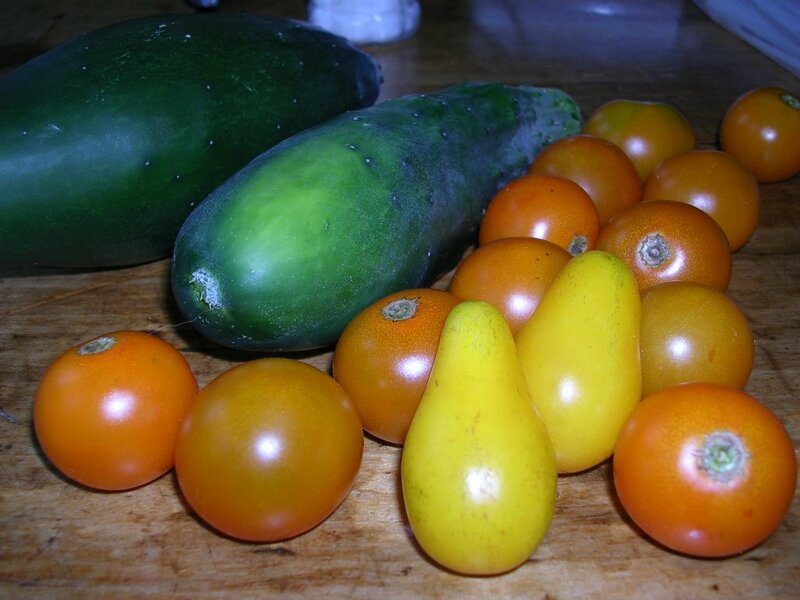 Bounty from the garden today includes these lucious sungold cherry and 2 yellow pear tomatoes, and 3 cucumbers, (1 given to a friend). 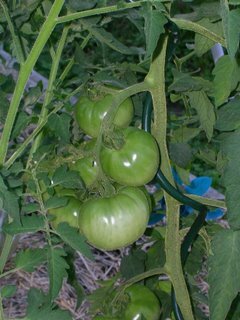 The garden is swinging into full production. The other day we had our first batch of new potatoes, they were scrumptious. 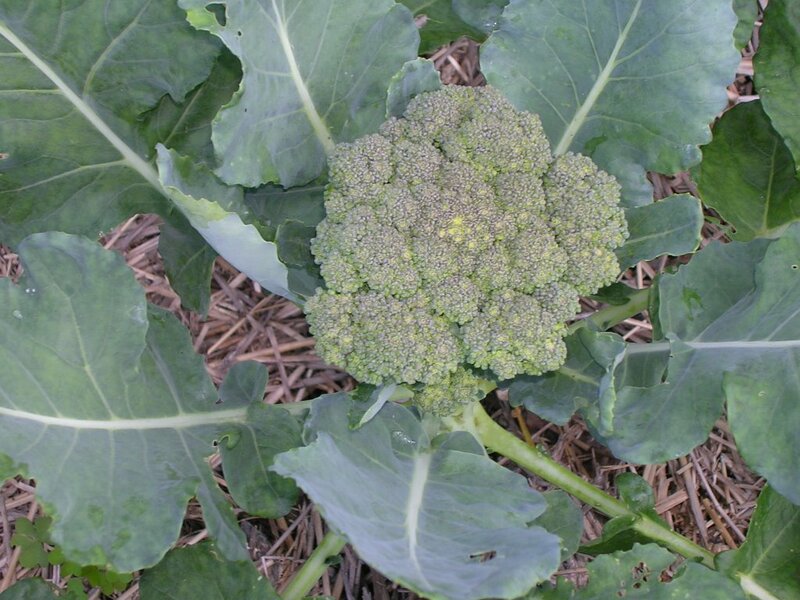 With them, our first harvest of broccoli, with more to come this week. And more blackberries, today an incredible 5 lbs., which makes for a total of 12 lbs. to date. 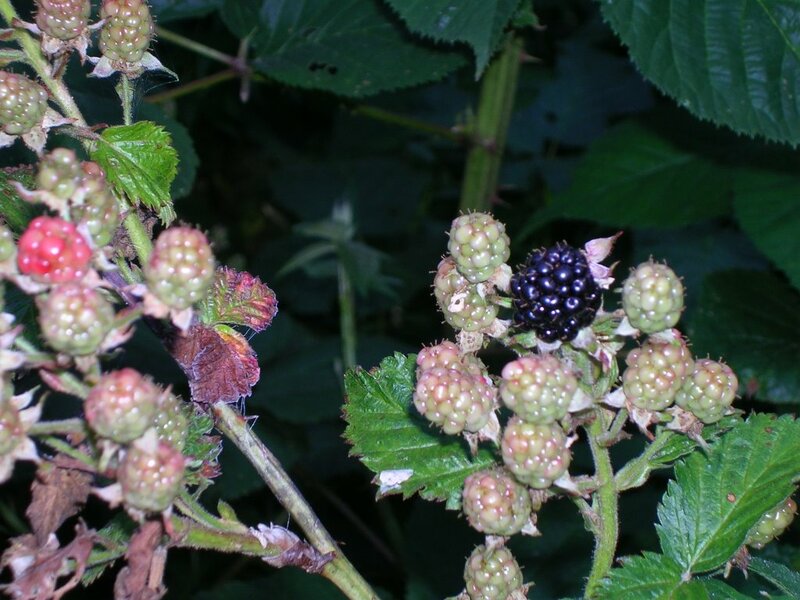 It is an amazingly good year for blackberries. It has been a strange year in the vegetable garden, though. 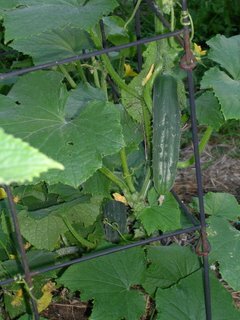 I've been gardening for years, and this year experienced my first crop failure of summer squash and zucchini --lost to the squash borer, a first for me. It was shaking my gardening confidence a bit (how often have I heard that zucchini could grow in a rock pile?) 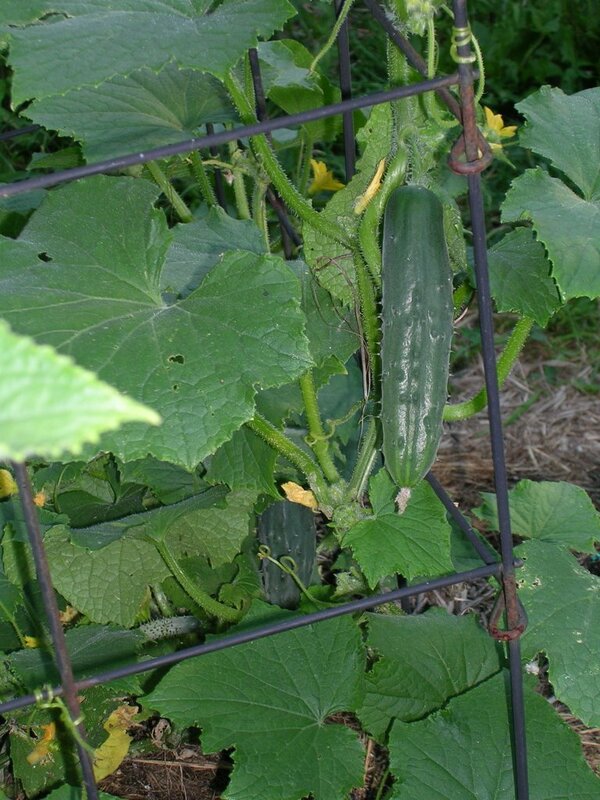 until I was at Goranson's farm and mentioned my lack of success and found they were also having squash problems. 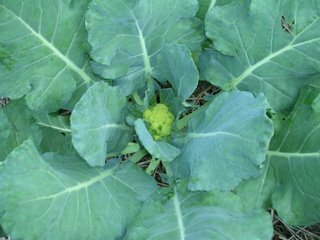 Still, the greens and chard have been good, and there is more to come, and the pole beans are blossoming, and we now have a protective fence around the garden, so there is much more good eating ahead. Despite all the eggcitement here yesterday, we did manage to get some work done. We completed the fence around the garden and installed the gate. 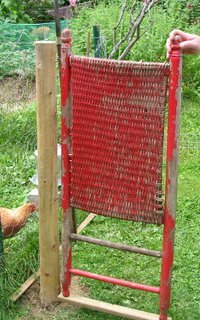 We continued the recycled theme with the gate, using the back from an old porch rocker which, of course, we rescued from the trash heap. We had the rocker sitting on the deck as a planter for a couple of years, then this year decided to deconstruct it for parts -- the posts were nicely turned hardwood, and the arms will make good signs ("Henbogle", for example). 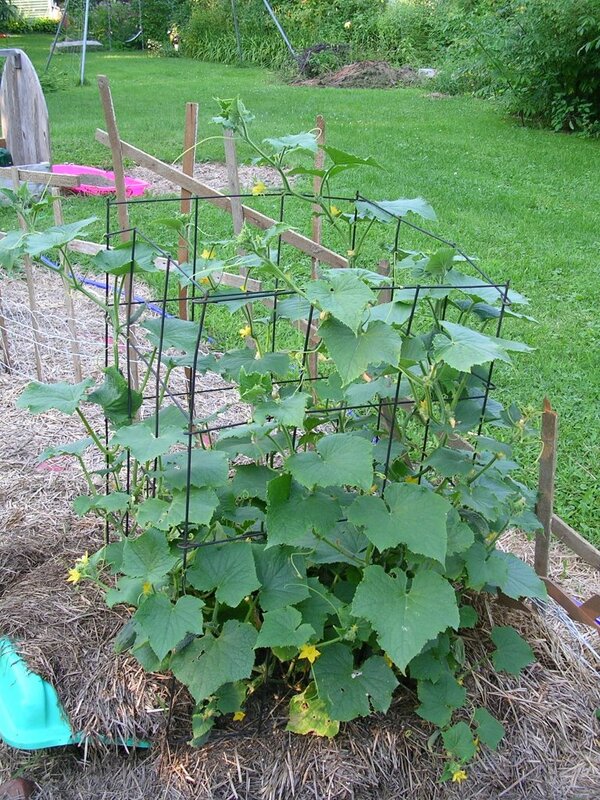 Then, as we discussed the idea of fencing in the garden to protect it from the evil groundhog, I realized the back would make an excellent gate. Dan cleverly made hinges from ell-screws and eye-screws, so the gate easily lifts off if needed. 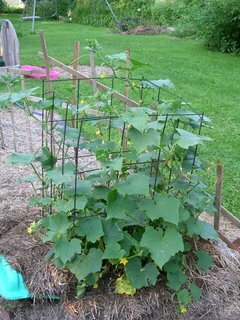 We added some small-mesh chicken wire at the bottom to keep out the rodent, and voila, a gate was made. Even if I do say so myself, it is very cute. Now, on to the chicken fencing (and painting the barn, staining the new deck, etc.). You know what they say, no rest for the wicked! Holy omelet, Batman, it's an egg! Over lunch, the chickens, very restless in their pen, started making a huge fuss, with lots of loud clucking and assorted chicken noises. We looked over, and all appeared fine, so thought no more of it. Later this afternoon, when we checked on them, we found an egg!!!! 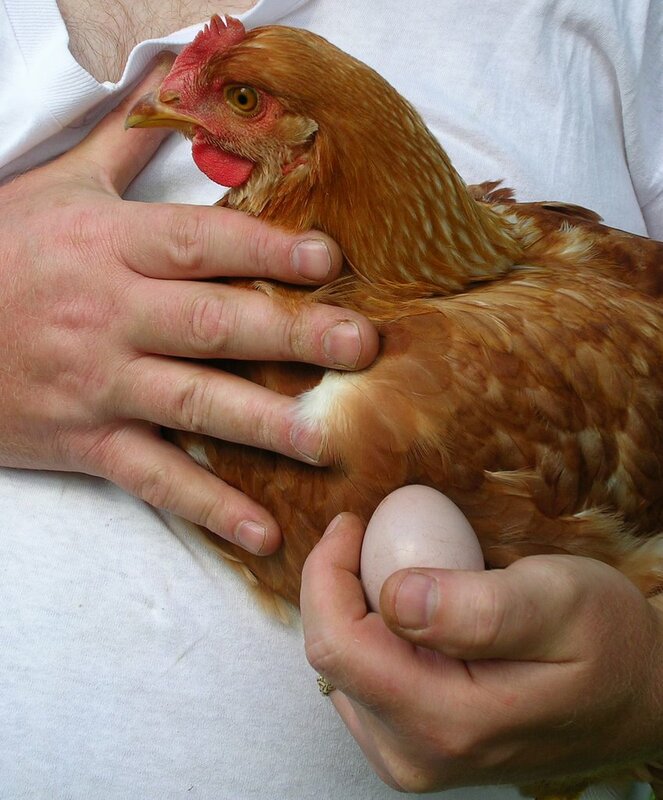 We don't know for sure, but we suspect our precocious bossy biddy, Hyacinth, seen here, laid her first egg. The chickens are just 16 weeks old. We weren't expecting eggs for several more weeks. 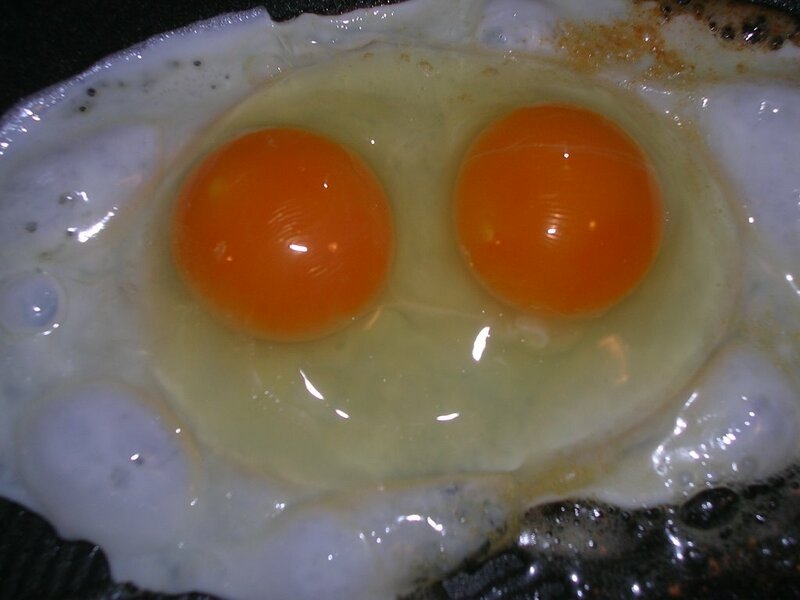 Now, the big question, fried or scrambled? In the age-old Maine tradition of dump picking, now-a-days known as recycling, Dan and I recently obtained 3 large rolls of wire mesh fencing. Our sharp-eyed friend Karen spotted it at the local transfer station in the metal pile, and told us about it. The next morning, we were at the transfer station when it opened to retrieve it. 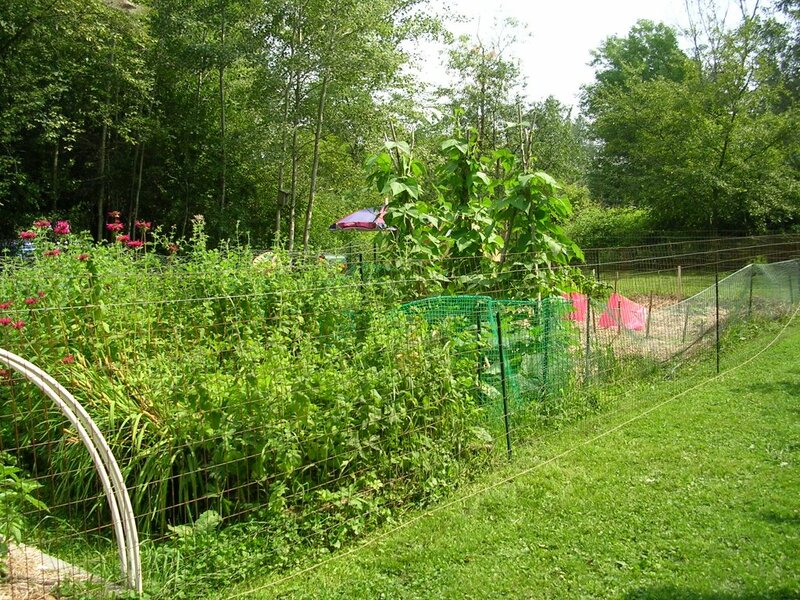 Anyhow, today, we begain the process of installing the new fencing around the garden, which is currently fenced red-neck style, with bits and pieces of leftover fencing garnered from yard sales, previous dump picking, etc. Once the new fencing is installed, we will remove the red-neck fencing, and use that to fence in the far back of the yard, to control the errant chickens. Yes, I said errant chickens. Our intrepid explorer hens have tasted freedom, and there is no keeping them in our yard anymore without completely fencing it in. 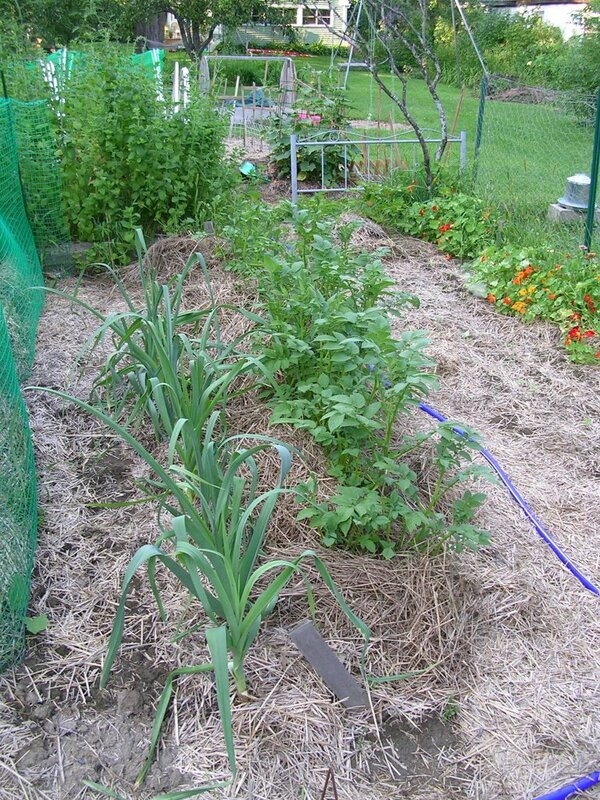 Saturday they committed the final transgression, getting in our neighbor Mike's vegetable garden. Mike was very gracious about it, but he was definitely not happy, so until we enclose the back portion of the yard, the chickens are unhappily imprisoned in their pen. If only we could train them with Fishy's Invisible Fence, but alas, the collar is too big for their scrawny little necks. Today we dug the postholes and sank the large cedar corner posts, and finished 3 sides of the fence. One thing I like about the mesh fencing is that it is nearly invisible from a distance. In the photo it can barely be seen, more visible is the old red-neck fencing on the inside of the new fence, sagging where we robbed a post from it. The next step will be to build the gate, and install the last side of the fence. 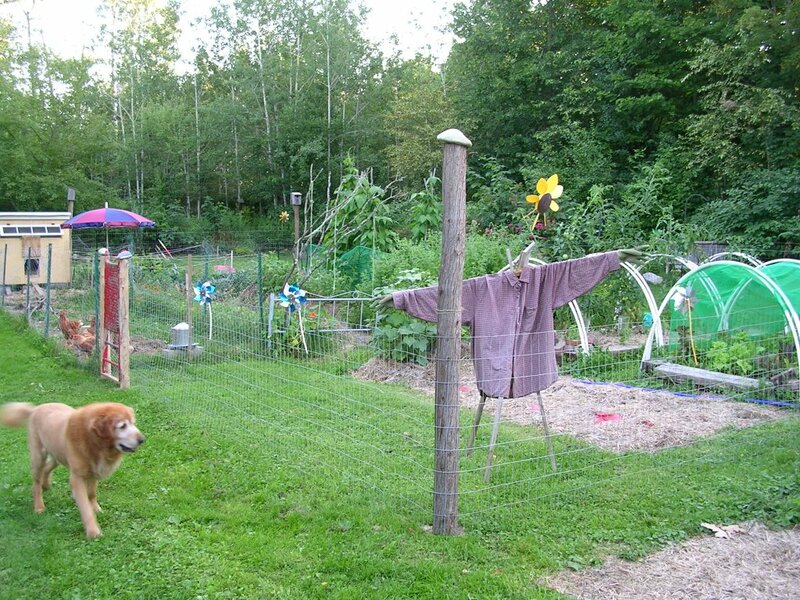 Then we start creating the chicken boundary around the back half of the yard. Perhaps by then, after a few days in the pen, Lewis & Cluck and their feathered companions will have learned their lesson and stay close to home. I got the peaches from the Card Farm in Bowdoin. 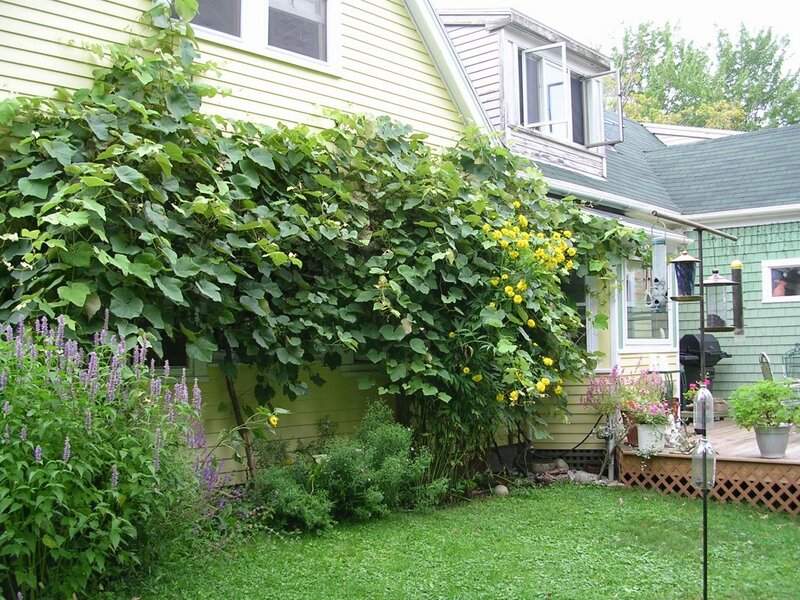 Frank Card grows peaches, plums, raspberries, highbush blueberries and vegetables on land that has been in his family since the early 1700s. We had a very interesting chat with Mr. Card, who has traced his ancestors all the way back to their arrival in the new world in Kittery, Maine. At his farm, we saw rows and rows of blueberries and peaches, and a gorgeous view to the western mountains. I am looking forward to the day my blueberries are as productive and beautiful. 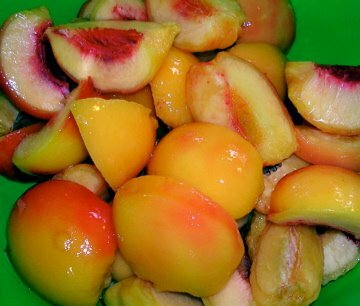 The visit left me inspired to order peach trees to plant next spring, and maybe apricots as well. 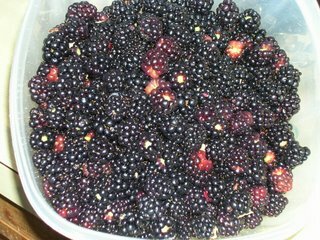 One of the other memorable treats we ate over our weddng weekend was blackberry pie, with blackberries picked from our very own patch. Blackberries are a favorite of my best friend Holly's dad, Bill. Bill & Esther are my adopted Indiana family, and the two of them drove out to Maine for the wedding and a visit with Holly. It just so happens that August 4 is also Bill's birthday, so to honor him, we picked blackberries and made a blackberry pie, which he generously shared. Thus my wedding anniversary always includes some blackberry picking. Friday we picked nearly 4lbs. 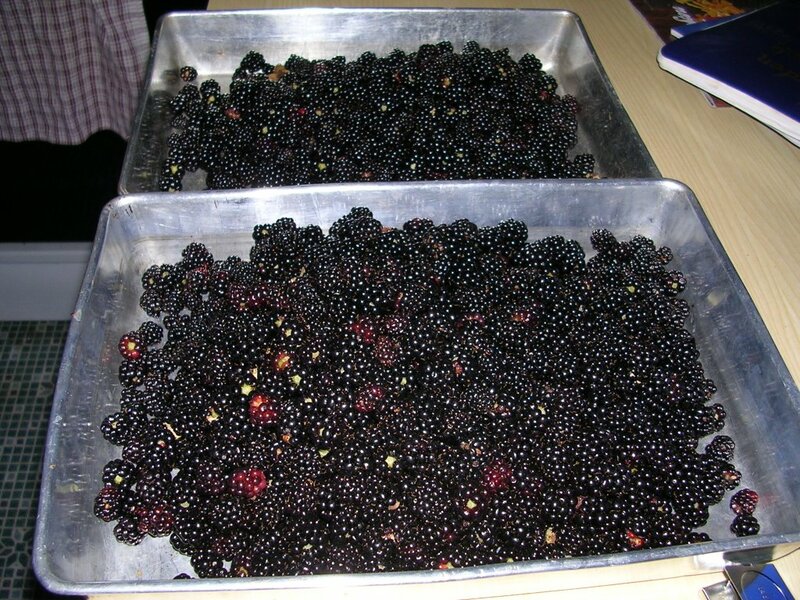 of berries, and today I picked a little over 3 lbs. 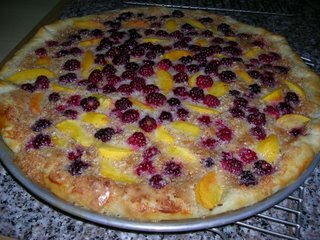 Some of today's berries are going to become a Blackberry-Peach Tart, using the recipe from the Rustic Cherry Tart, the rest, along with our earlier pickings, are in the freezer and will be used all winter for fruit smoothies and other delightful treats. And by the way, Pop. Happy Birthday, a few days late. Today is our wedding anniversary. 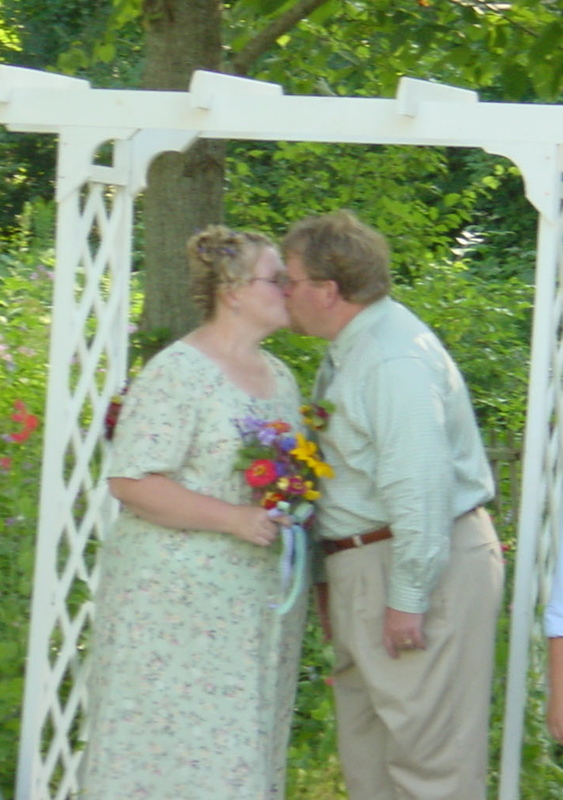 Five years ago today, at a few minutes before 5 pm, Dan and I exchanged vows before 50 of our family and friends, in the backyard of our home, under the same arbor our friends Cathy and Fred used for their wedding earlier in the summer. 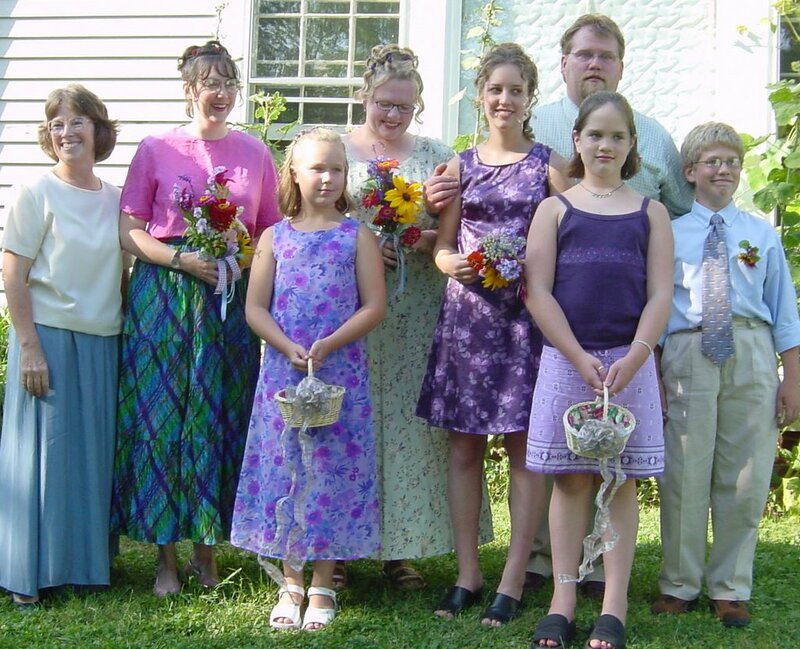 It was the culmination of one of the happiest summers of my life, (our first summer in the house) as Dan and I together planned the day and readied our home to be the site for the ceremony. 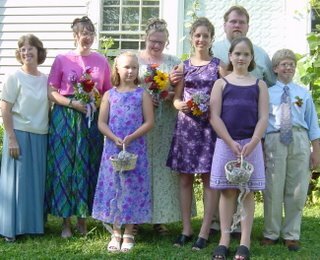 (This excludes the black day when I discovered the evil groundhog had EATEN all the flower seedlings I planted for my wedding ceremony. More than a few tears were shed that day, and it is a good thing I did not have access to high-tech weapons). My best friend Holly and I arranged all the flowers, purchased from a local grower, Kennebec Flower Farm, and we had an old-fashioned chicken barbecue dinner. My friend Cathy made the cake, and did a truly fabulous job decorating it in plaid, Dan's favorite color. 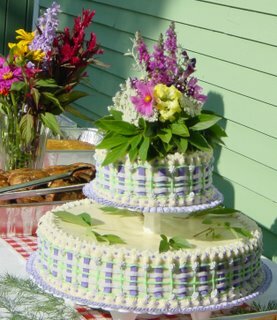 And it tasted really good, too -- real butter in that cake, and a cream cheese frosting. We later spent much of our honeymoon (and the honeymoon $) searching for and purchasing a new refridgerator which would not require a kitchen remodel to fit in the allotted space. Five years later, we are still loving each other, our life together, our home, and yes, still battling the evil groundhogs (latest victim-- all the parsley). Would I do it again? You bet. 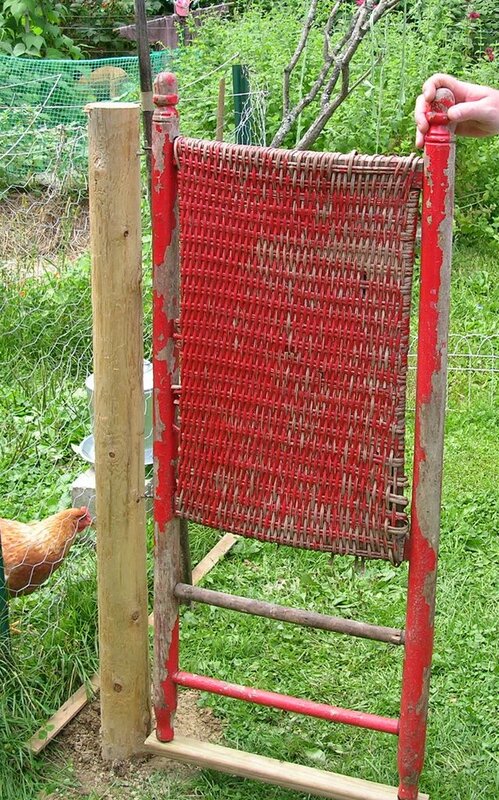 Chickens have no sense of propriety. The bench was a wedding gift! (Note Poppy in the lilac on the right). All the rain this spring has done wonders for our grapevine. Just 2 years ago it received a severe pruning to allow us to paint the house. After painting, we built a rustic twig arbor for the grapevine, and began training it across the picture window overlooking the backyard, hoping to keep the house cooler. 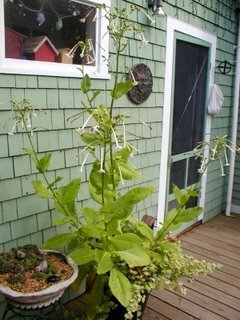 This year it has exploded, growing so heavy it broke the arbor, and is now sagging in front of the window completely blocking the view. It does keep the house remarkably cooler, to give it credit. However, it looks like it will devour the house --note it climbing the second story window screen. 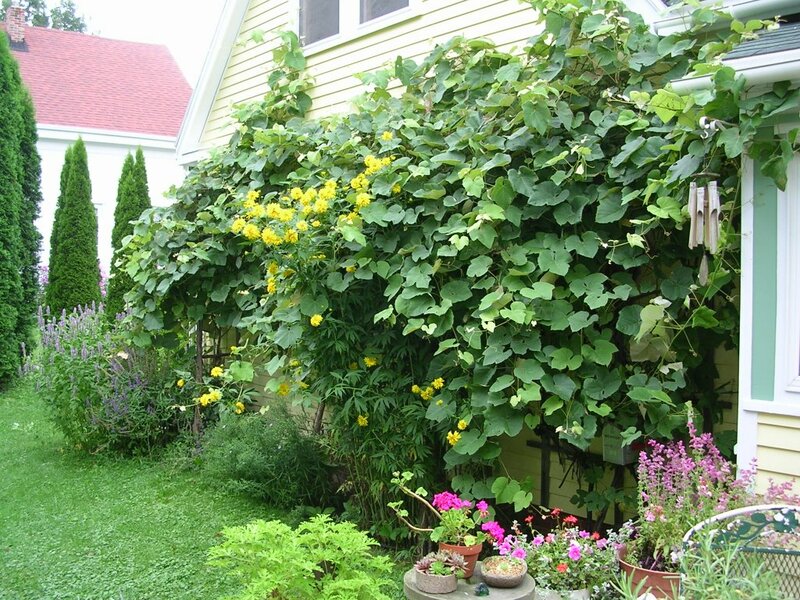 The Golden Glow is also incredibly vigorous this year, blooming frantically through the crushing grapevine. That will need to be moved next year. We are now sketching designs for a new grapevine arbor to be built this fall, once the leaves have died back so that we can see what we are doing. Longer-term plans call for a pergola on the deck, and we will then train the grapevine across the pergola to give us desperately needed summer shade (yesterday it was over 100° F on the deck).